If you don't already know where we are right now, then that means you haven't communicated with us lately and you haven't communicated with the top of the two titles on this page. Before reminding you of that, the second (interior) title should give you two very good clues. Where's the best place in the world for chocolate, according to the locals? The answer is the same as on the very top of this page: Belgium. And ditto for chips (or french fries if you hale from the Americas; chips is the British term, of course, and as we are half and half, we chose the alliterative word. 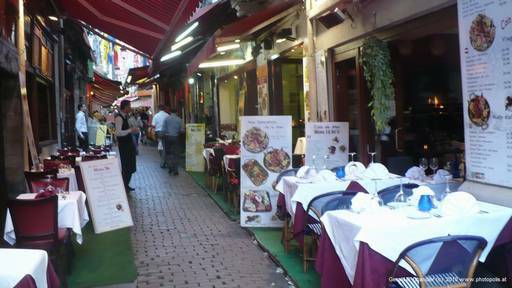 The three pictures just above show Brussels' Rue des Bouchers, famous for serving the Belgian national dish, "Moules Frites" (Mussels and Chips); Gerry is about to dig into a plate; the third picture shows the preliminaries to scoffing a waffle (wolfing down), another national favorite. It was Yummy Yummy! Let us quote ourselves, from our Frontpage of October, 2009 : "Sometimes you get an offer you can't refuse. That's what it was like when our friends the Ellises wanted to know if we would house-sit for them in September-October-November 2010. Their home is a comfortable place in the suburbs of Brussels. A new city is just what we wanted, so we immediately said yes." 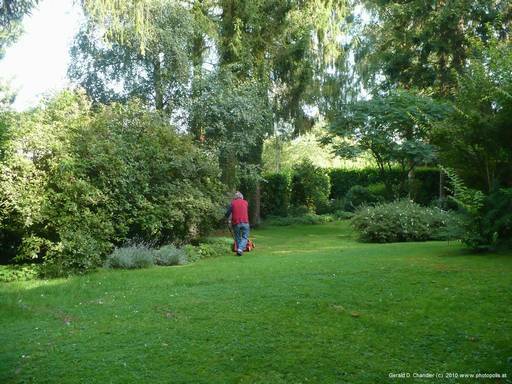 Nine months later, on July 1, we arrived by Eurostar from London and got our introduction to that comfortable place, a very treed and lawned home in Wezembeek-Oppem, all of 12 km ESE of central Brussels. Well before we came, we'd laid plans to bicycle from Brussels to Copenhagen. Steve and Anna had kindly stored our bikes (and much other stuff) for us. 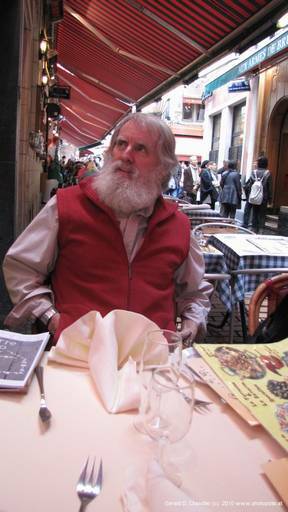 Unfortunately by the time we arrived Gerry was among the nearly-walking wounded. In Japan we both recovered from existing troubles but unfortunately with just two weeks to go, Gerry's right leg and knee gave out from overuse. While Steve and Anna went off to sylvanian surrounds in France, we unexpectedly occupied their home for three weeks (rather than starting September 1) in the vain hope we'd take off for Copenhagen by bike. When that proved a chimera we lit out for other parts — see below for some details. On August 29 we came back and got our second introduction to the care and pruning of our current habitat before Steve and Anna went to Australia. After 11 years of being homeless and gardenless, it is strange to be getting back into our old routine from New Jersey, of watering plants, mowing the lawn, and, soon to come, raking the leaves. It is a pleasant reminder of the life we gave up to lead our nomadic lifestyle, and of a life that someday, no doubt, we will live again. Besides enjoying the house and the household duties we have gotten out a bit to see Wezembeek-Oppem, central Brussels, points in between, and even farther afield. 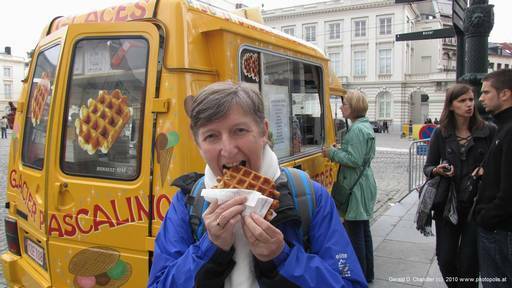 It took us several weeks to get over to Brussels Grand Place but when we did, we loved it. And weeks later we went to Leuven's minature version of a Grand Place, also decorated with a lovely decorated Stadhuis (City Hall). After having seen so many museums in New Zealand and Japan we were more than museumed-out when we got here. But museum-fatigue has slowly dissipated and we've enjoyed the Musee des Beaux Arts (Fine Arts) twice and will go again. And one Sunday there was a terrific open-house and we visited five (or was it six) turn-of-the-century architectural masterpieces. 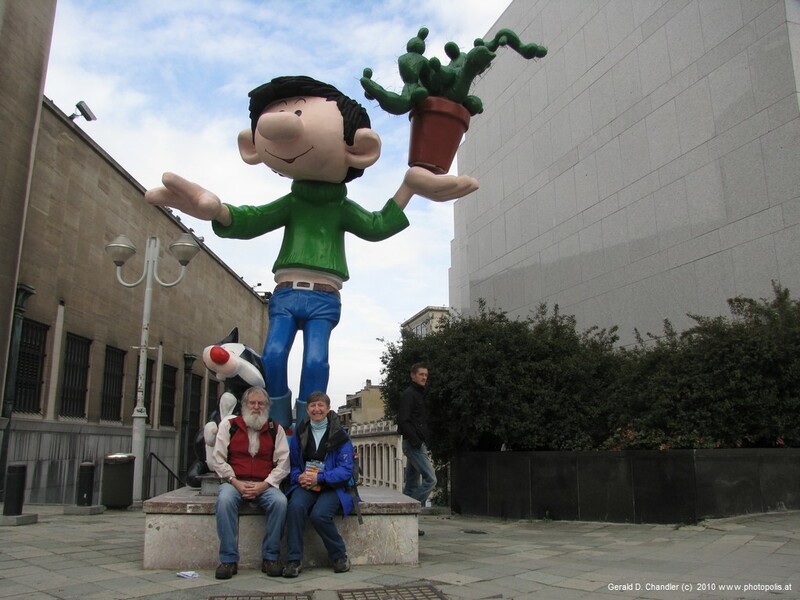 On the same day we met a very giant version of Gaston , a famous Belgian comic character (see top photo). After leaving Paris in October, 2010 we went off to Darlington for a few weeks and then on to Christchurch where we continued our more or less sedentary life. Three months after leaving Paris we left Christchurch for a far too hectic van trip around New Zealand. We then repeated the New Zealand pattern with a rather settled period in Tokyo and then more intensive travel around Japan, all crammed into a few days less than three months. (Alright, we know you are crying crocodile tears for us.). From Japan we flew back to Europe and, after a very brief week in Darlington, took the Eurostar to Brussels to stay with Anna and Steve. As mentioned above we spent three weeks trying to recuperate from joint and ligament complaints so that we could embark on another long-distance bike trip. When it finally became clear that going off on a bike would be crazy we looked around for somewhere to spend August. We found a nice place in Copenhagen, our original goal, but we found a better deal in Vienna. The deal was sealed in our minds when the fellow already in the apartment (and leaving) gave us a video tour via Skype by carrying around his WiFi-connected laptop. We felt as if we'd entered the digital age. How do you get from Brussels to Vienna? We couldn't get anywhere as good a deal on the train as we could get from Ryanair. The catch was that Ryanair flies from Charleroi to Bratislava. Charleroi is an hour from Brussels, closer really than we used to travel from Middletown NJ to Kennedy Airport, so that was no big deal. 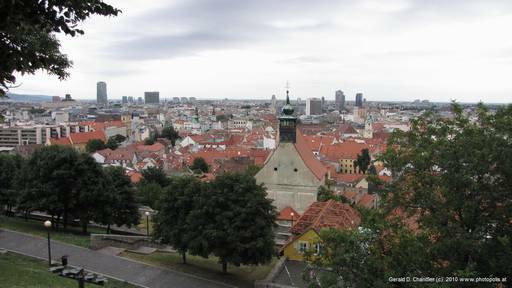 And it was a plus for us to go via Bratislava since we'd never been there and it would give Jan a new taste of Slovakia, which she'd last visited as a student in 1969. Because of the dates for the Vienna apartment we spent four nights there. Jan found that although she couldn't speak Slovak, the Slovaks understood her quite well when she spoke Russian. Vienna proved wonderful. Of course it is famous but we hardly expected to rate it up there with Paris. As almost seems habitual now it took us a full week to get very far from the apartment we were in; that was because travel and excessive use in Bratislava had set back Gerry's leg. 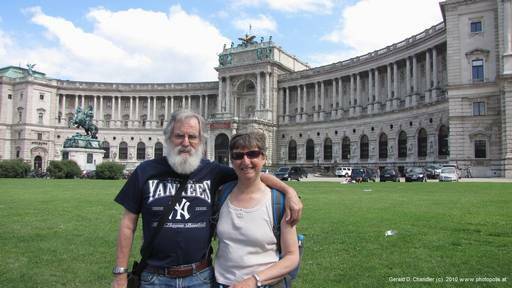 Our first outing was to take a look at the famous Ring, in particular the part near the Neue Burg. We were blown away by this palace and its surroundings. We were back to the area many times, including twice to the plaza in front of the nearby City Hall where we went to the outdoor cinema twice in front of a giant screen and another time to tour the Parliament building. Their finery is just what we like in a building. Although hard on our legs we walked a good part of the city. Early on we found a used Fodor's Guide at a church-run used goods store; it had five walks and we did them all. 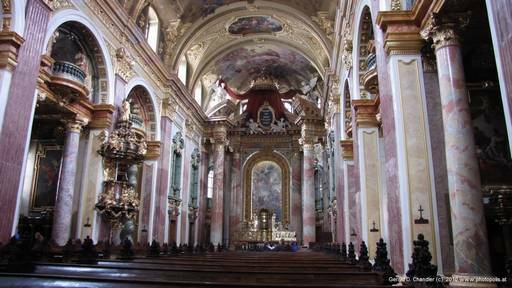 Every walk included at least one and usually two or three magnificient churches: University (Jesuit), St Michaels, Dominican, Karlkirche, Votive, and many more. So many top-notch places. 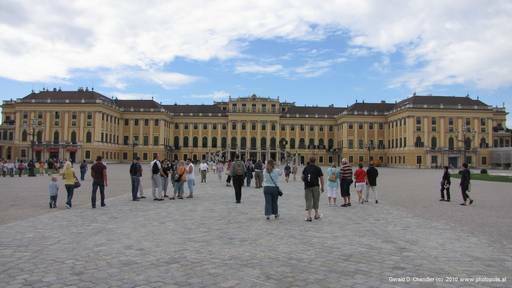 We tried out many aspects of Vienna's food, eating at several of the famous cafes which although they now attract mostly tourists, were very good. We had two interludes outside of the city into Austria profound. 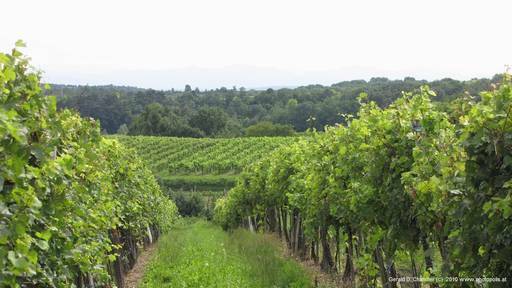 On the first we went out for the day to the Weinviertel, the so-called Wine Quarter, which was completely new to us. On the second we went to visit old friends, last seen in 1994, in Stockenboi, a mountain village not so far from their main home in Spittal-an-der-Drau. The woman who owns the apartment we rented lives in Japan with her Indian-American husband; Traudl, her retired mother, handles much of the details of working with tenants. They operate under the name Kultur Impuls which is where you can contact them if you want an extended stay in Vienna. We hit it off with Traudl right away; she is between us in age so it is easy to relate to her and she is friendly and outgoing. It might also have helped that she is a retired physics teacher. One day she announced to us that she was making her annual wine buying trip to the countryside; would we like to go along? Of course we would. So on Sunday, blessed by fine weather that broke up a spell of rain, we had a great day out. We visited the wine grower, bottler, and merchant — all the same man — and had a mini tour of his estate and a taste of his wine, the latter being Grüner_Veltliner, a grape new to us but a speciality of the region. (The vines in the photo above are probably Grüner_Veltliner.) The trip there and back was through rolling hills and small villages, all very fine to look at. We found that the round-trip fare for two on the train to Stockenboi was almost exactly the same as the rental of a small car plus our expected fuel costs. Since taking a car would make it very easy to carry all the luggage we wanted and would save Jane and Ingo the trouble of picking us up we opted for the car. We used Google maps to chart the shortest route, which we expected would be the most scenic since it took us over several mountain passes. The drive was beyond scenic; it was great. Going out we stopped in Muerzzuschlag, one hour from Vienna; when we had told Traudl of our plans she invited us to stop in for breakfast — it's her home! We also stopped in Bruck an der Mur and Judenburg, two cities that have preserved a bit of the 14th century in their centers. 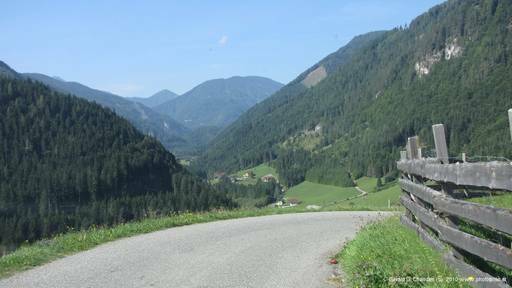 Coming back, we stopped for short visits to the very touristic Millstaettersee and Turracherhohe, the highest pass and which is approached from both sides by long stretches of 23% sloping rodes. With Jane and Ingo we had fine conversations, great local dishes thanks to them, a nice day trip and lunch on the Weissensee and a long afternoon sitting in the main square of Klagenfurt enjoying a drink, conversation, and the beautiful historic surroundings. Now a confession. Actually, you probably already knew it. We are a few days short of a year late in updating this, our web page. How did that happen, given that our goal was to do it about every two months? Well, we followed the advice given in our 2009 end-of-year letter: be happy and don't make New Year's resolutions, or if you do, don't keep them. Of course we'd proclaimed our goal well before New Year's, so that isn't really the explanation. This is what happened: At first we were just too busy enjoying ourselves and then when we begrudingly decided to update the page technical problems interceded, and then we got busy enjoying ourselves again. We did write a short Frontpage about our early times in Christchurch but never posted it. Now we have. And after a month of sort of being settled, and working lots of days on the complete treatment Christchurch and New Zealand pages we have posted them. You'll find hundreds of Kiwi photos there. Lastly, linking it all, is this new Frontpage. Our next project is to write up completely Tokyo and Japan and then Vienna. It will certainly be after we've left Brussels that we get up a good web treatment of it.